We took a look yesterday at what sort of projects can be knit up with jumbo yarn to enhance the WOW factor in our living space. Today, we’ll look at 3 knitwear patterns that can be knit so quickly you’ll be done with your Holiday Season gifts in very little time using Irresistible yarn. Do you remember? I clocked my knitting time to 1 ball per hour, so use this to gauge how long it will take on average to knit all the items discussed this week. Red Heart’s Irresistible yarn very yummy Enchanted colorway. In the back of the label of Irresistible yarn is a pattern for the cowl that’s on the front of it. It took me 1 hour to make it. Worked up in garter stitch in the photo below is what it looks like in Taupe. This is the 15th ball of yarn I decided not to use for the blanket. I’d prefer this cowl in any of the variegated colorways for more interest. The variegation adds pop with bits of colors here and there. 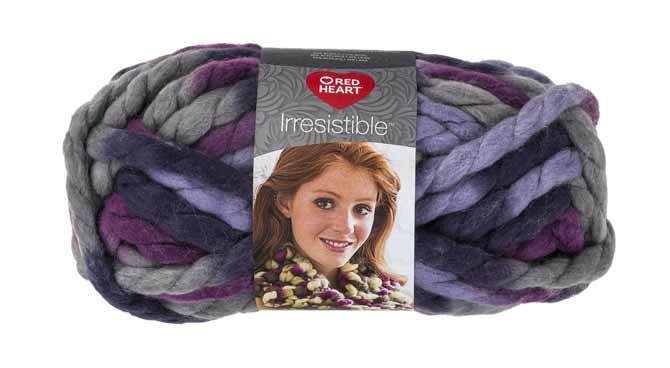 Out of 20 colors, Irresistible comes in 6 variegated colorways, so there’s lots from which to choose. Speaking of variegated options, here are 2 accessories that use variegated yarn differently. The one in the photo below is called Quick to Warm Poncho and, after our week long review of Irresistible yarn, we know why it’s called ‘quick’. You’ll need 4 balls for this pattern. First, let me say how much I LOVE this colorway, purples are my thing – there, got it out of my system. Second, this lacy pattern lets the yarn breath, making this jumbo yarn appear lighter than when it’s knit up into a blanket or throw. Knit up this super, fun and trendy poncho in the color that makes you quake! Color Dip Scarf best described as the best of both worlds, using Irresistible yarn’s solid and variegated colors, adding just the right amount of pop to this trendy accessory. And it will keep you warm! Start now, and you’ll be set for winter. 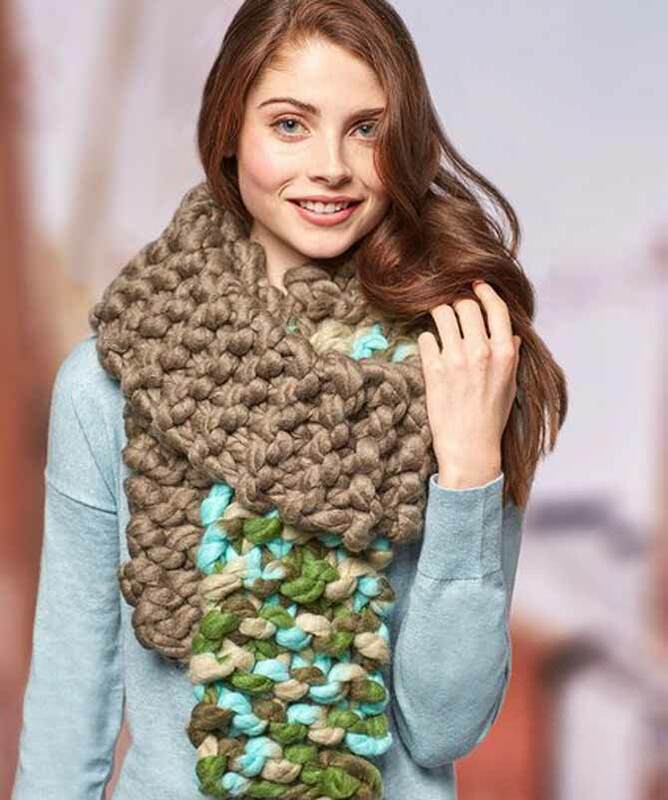 This scarf uses 2 balls of Irresistible yarn, using one solid and one variegated color. There have been so many suggestions on the fashion runways on how to wear jumbo yarn knitted items. All you need to do is an image search on the internet to be inspired. 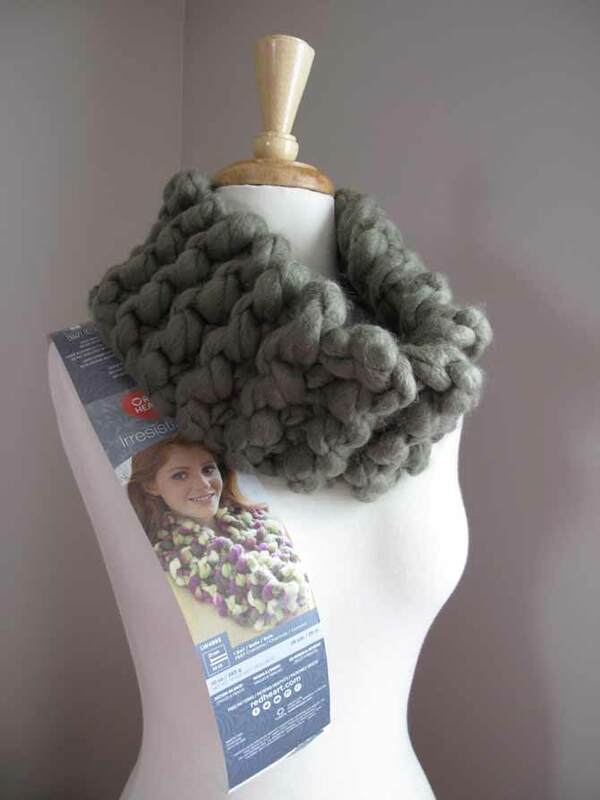 Enjoy the creative process using Red Heart Boutique Irresistible yarn. Happy knitting – always.